Sometimes, it is just the simplest of gestures that makes all the difference in the world. When Claregalway farmer Mattie Cormican’s wife Bridie passed away after suffering from Alzheimer’s disease, he made a decision that will honour her memory and make a contribution to the future of the community that will serve generations. 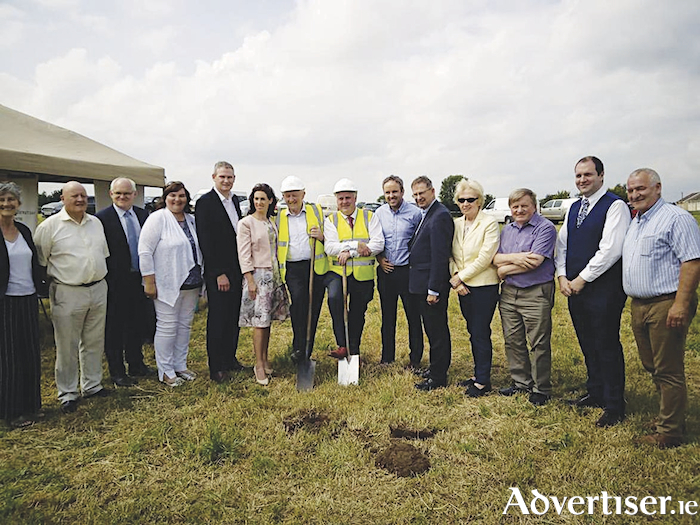 He donated two acres of prime land, not far from the centre of Claregalway that has become the site for the Claregalway and District Day Care Centre that will cater for 125 people when it is up and running next year. It will also become the location for 14 sheltered houses for elderly people who would like to live in a supported setting close to the heart of their community, near shops and the church. At the moment, the centre occupies a bungalow right in the middle of the village where every day 15 elderly people come along to avail of socialisation, to play cards, to converse, to partake in arts and crafts and other activities that challenge them in a positive way, mentally and physically. They are collected on a minibus which is staffed and driven by volunteer drivers and the centre itself is run to the highest standards buy a team of dedicated professionals who proffer their services for the good of their community. This service is primarily funded through the ‘Never Too Old Charity Shop’ in Cois Chlair, Claregalway (behind The Arches Hotel ). The Charity Shop is run by volunteers so all proceeds are donated to the Day Care Centre. The shop welcomes donations of good quality, re-sellable clothes, bric a brac and furniture. Freshly-baked scones and tea greet them on arrival and a hot nutritious meal is provided at lunch time. The day service is available Monday-Fricay from 10.00am until 3.00pm. The longterm dream was to build the sort of facility that is now being constructed, but it remained a pipedream until Mattie Cormican took a stroll onto his land not long after Bridie had passed away, and thought to himself about what way he could honour her memory and make an immense contribution to his community. Mattie is a proud man, a religious man, a man of great integrity, so when he discussed it with his family, they too agreed that it would be an outstanding way to remember their mother. His family already are at the heart of many positive initiatives in the village, so it didn’t take too much convincing. He approached the committee and once he was convinced of their determination and of the statue of people like Geraldine Carr, Seamus McNulty, Julie McKenna, Seamus O’Connell, George Glynn and Tom McCann and many others, he knew the project would see the light of day. And so to Tuesday, when with Dep Noel Grealish by his side, sharing the two spades to turn the first sods, Mattie Cormican gave an emotional speech that moved everyone there. Construction is now underway and it will open its doors next Spring. Western Alzheimers will partner with the Claregalway & District Day Care Centre to provide €180k of the funds in return for 10 places at the centre to be used by the charity for those living with Alzheimers and dementia. The Government have provided the €2m for the residential homes and about half a million euro has to be raised for the Day Care Centre and the fundraising drive for that is continuous, with charity runs and events held to meet this target. It is a fact that day care centres delay or even eliminate the need for long term nursing care for older people at a fraction of the cost of nursing facilities.Day care centres also keep older people active, engaged and cared for, avoiding isolation and depression as well as providing much needed respite for families. The HSE refers the majority of service users to the current day care centre in Claregalway but contributes only €10k a year to the running costs. The charity raises the rest of the over €100k per year required. Facilities such as that being built in Claregalway are the future for all our ageing communities. The rest of the country is watching this model project and there is a hope that hundreds of other communities can be rolled out across the rest of the country. Thankfully, this community has Mattie Cormican as a proud member and it will forever be grateful to him for his generosity. His love for his wife Bridie will now have a monument forever that the whole community can use and appreciate.